CLICK HERE TO SEE NEW ITEMS! VERY RARE JOHN BLISS BINNACLE COMPASS! You will not have seen anything like this before in this condition with this age or solid American pedigree. Presented is a Mid 19 th Century twin burner binnacle compass, serial number 6414, which is housed in as elegant a mushroom style case as you will ever see. The brass ring of the compass is stamped with the serial number 6414 and John Bliss & Co., New York. THE BINNACLE: The binnacle is a classic, but rarely seen, mushroom design which was popular in the more important yachts of the Mid 1800's. This one, because of its smaller size, was likely installed in a sailboat or tender to a much larger yacht. It features a very old style card which is only marked in Compass Points with one point equal to 11 1/4 degrees. The compass is viewed though a beautiful eliptical glass opening secured by a rolled metal rim . Twin lamp burner towers are on each side of the "helmet". The left side is missing its removable oil lamp while the right side has been fitted with an electrical socket for illumination. THE COMPASS CARD: North is identified with a Flur des Lis, and has John Bliss & Co., New York. beneath. The outer ring of the compass card is graduated compass points. The larger subdivisions are in Cardinal Points, N.S,E,W, and quarter points, NE,SE,SW,NW, then 1/2 points, 1/8 points and finally 1/16 points. There are 32 points on the compass card, each being 11 1/4 degrees. This beautifully made antique compass is of all brass construction with only a few minor small dents as evidence of its use at sea. Condition is exceptional throughout. All surfaces have been recently polished and lacquered a nice golden patina. The compass works properly. Diameter of bowl 5 1/4" Diameter of card 4 1/4"
HISTORY: John Bliss, Sr. was born in Norwich, CT in 1795, and died in Brooklyn, NY on October 15, 1857. He apprenticed to his uncle, Benjamin Lord in Rutland, VT as a silversmith and clock maker, and later moved to New York City as a jeweler around 1830. In 1834 he went into partnership with Fredrick Creighton, an English watchmaker at 42 Fulton St. for the making of chronometers under the name, Bliss & Creighton. They were one of the few in this country who made chronometers from scratch and also patented a new escapement which reduced chronometer error. However, the partnership did not last, and they went their separate ways in 1853. John Bliss then joined with his son John, Jr., establishing the firm John Bliss & Son in 1855. When John Bliss, Sr. died in 1857, the name of the company was changed to John Bliss & Co., which endured for 100 years. The Bliss firm was a noted purveyor and repair shop for nautical instruments of all kinds. On August 4, 1871, Bliss purchased the famous E. & G.W. Blunt & Co. whose operations as a seller of nautical instruments dates from 1821 in New York. Blunt was also noted for publishing a Nautical Almanac staring in 1850. 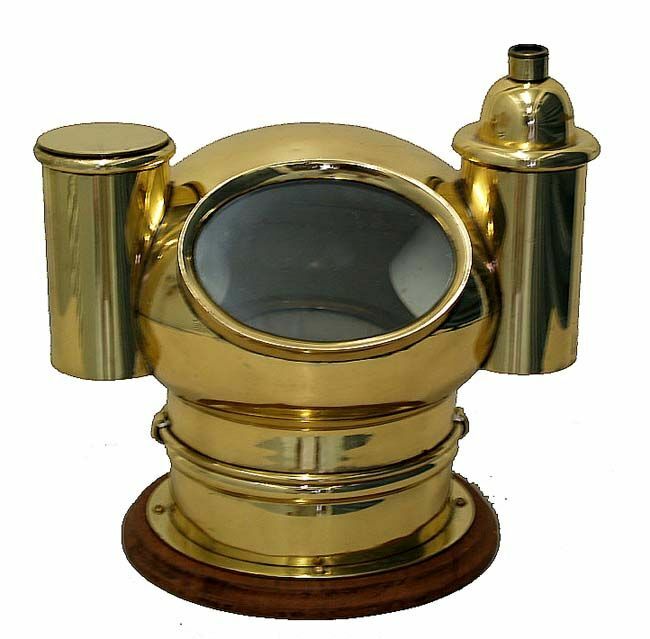 The famous Schooner yacht Intrepid, owned by Lloyd Phoenix, Vice Commodore of the New York Yacht Club in 1903, was fitted with a John Bliss compass. SHIPPING & PACKING: The cost of shipping, packing, handling, and insurance to your destination is an additional charge. You may email us to get these costs. We price our shipping honestly, but we expect to be reimbursed for the nominal cost of packaging materials and handling. This is a very rare and important mushroom style binnacle that dates back to Ca 1860 made by a pedigreed American instrument maker. Buy this historic collector's compass Now! Copyright 2006 by Land And Sea Collection, All Rights Reserved.